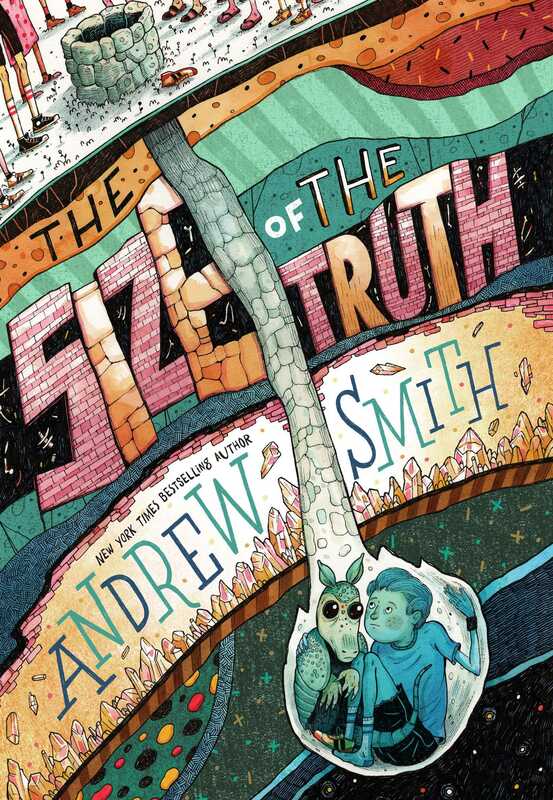 A boy who spent three days trapped in a well tries to overcome his PTSD and claustrophobia so he can fulfill his dream of becoming a famous chef in this charming novel that is Andrew Smith’s first foray into middle grade storytelling. But Sam doesn’t like their plans. He doesn’t want to go to MIT. And he doesn’t want to skip two grades, being stuck in the eighth grade as an eleven-year-old with James Jenkins, the boy he’s sure pushed him into the well in the first place. He wants to be a chef. And he’s going to start by entering the first annual Blue Creek Days Colonel Jenkins Macaroni and Cheese Cook-Off. That is, if he can survive eighth grade, and figure out the size of the truth that has slipped Sam’s memory for seven years. The Size of the Truth BEING ALONE IN THE DARK, IN A HOLE, ON THANKSGIVING DAY, IS NOT MUCH FUN; OR, OH WELL! This all starts with my first enormous truth, which was a hole. When I was four years old, on Thanksgiving Day, I fell into a very deep, very small hole. There were things in that hole. Things besides just me and dirt. Some people can’t remember anything at all from when they were four years old. It seems like most people’s memories begin when they’re in kindergarten or first grade. I can remember things that happened to me when I was only two. For example, I remember the first time I met Karim—just after he and his family moved into the house down the road from ours. That happened when I was two. But for years I could not remember what happened to me when I fell into that hole. People say I’m smart. It’s not my fault, though. I never tried to be smart. To be honest, which is something I always do try to be, I stopped being able to talk after I got out of the hole, so I started school late, when I was seven. It was like being in a race, where every other boy and girl had a two-year head start on me. At least Karim always stuck with me, until we couldn’t stick anymore. The hole I fell into was an old well. What I fell into was a hole that nobody bothered to point out to me was still there and was also still a hole. A very deep one. That day, Karim and I were running around in the woods behind his house with some older boys from the neighborhood, playing a game called Spud with a soccer ball that had gone flat. If this older kid named James Jenkins, who nobody liked and everyone was afraid of, hadn’t thrown the ball so high before Karim could catch it and yell Spud!, I would not have taken that last step (which wasn’t a step, to be honest, since planet Earth was not beneath my foot), and I would not have been swallowed up by a hole. But that’s what happened, and I fell. I felt my left shoe come off. As scary as falling into an abandoned well might sound when you aren’t in the middle of falling into one, I remember feeling far more confused than frightened as I slipped farther and farther down beneath the surface of Texas. Falling seemed to take forever. I hit things, and dirt got into my mouth and nose. My jeans twisted around, and my T-shirt got pulled up around my shoulders. Somehow, my feet ended up above me and my head pointed down. As I fell, I worried about Mom and Dad, and how they were going to be mad at me. Everything smelled and tasted like dirt. And I was upside down, lying like a capital J, looking up at my feet and a fist-size patch of blue, which would have been the afternoon sky above the hole I fell through. I spit mud out of my mouth. I tried to move, to pull myself up. Then the walls around my shoulders seemed to widen out, and I fell again. The second trip was shorter than the first, and this time I hit what must have been the flat bottom of the well. I lay on my side with my arms curled around my head. Little bits of dirt and pebbles sprinkled down on me from the walls above. It sounded like rain. I shut my eyes. That was when I started being much more scared than confused. It was also when I started to cry, which made mudslides all over my face. When you’re four, it really isn’t a big deal if you cry, right? I mean, unlike when you’re a boy in middle school, when it becomes a completely different issue with all kinds of costly consequences. So I’m not embarrassed to say I cried. But let me make it clear: I was four, and I was at the bottom of a very deep hole. I didn’t think I was hurt, but I wasn’t really sure, either. I lay there for so long, just holding my head and trying to think about what had happened to me, and why this hole was here in the first place, but nothing made much sense. It was Thanksgiving Day, and Mom and Dad were going to be so mad at me. I may have gone to sleep. After falling into an abandoned well, four-year-old Sam Abernathy copes with his situation the only way he knows how: he befriends a delightfully sarcastic resident armadillo prankster named Bartleby. Bartleby inhabits the tunnels surrounding the hopelessly cramped well, and encourages Sam to explore the mazes and their secret treasures. The narrative then shifts to eleven-year-old Sam’s eighth-grade year in a Texas small-town middle school where he’s skipped two grades, resulting in an equally awkward sense of entrapment. Making hopeful attempts to express his true self and, once again, in need of escape from a life he feels helpless to influence, Sam finds a way to explore the deeply rooted fears, assumptions, and limitations that have led to his current situation. Traveling back and forth between Sam’s experiences as a four-year-old in a well and an adolescent grades ahead of his peers, the book follows Sam’s realization that some truths are more difficult to reach than others. It’s only when Sam reaches out to James Jenkins in a selfless act of kindness that both boys begin to understand the need for reclaiming who they really are. 1. In what ways do you think the author captures a distinct middle school voice and tone? How credible did you find Sam as a narrator? Could you trust what was true for him? Explain your answers. 2. Would you consider this story to be plot-based, issue-driven, or character-driven, or a combination of each? Explain your answers. 3. What do you think of the book’s cover design? What did it immediately suggest to you? Did it make you want to read the book? 4. Which character did you relate to most? What about that character did you identify or connect with? Which character was most unlike you? Explain your answer. Was there someone you admired most? If so, who, and for what reasons? 5. Consider the title, The Size of the Truth. What does it mean to you? Within the context of this story, how do you think Andrew Smith defines “truth”? Do you think different people can experience different truths? 6. How does the culture of Blue Creek, Texas, contribute to the unfolding of the story? How might the story have been different if it had been set in a bigger city? 7. Why might the author have chosen to tell the story by shifting between past and present? How did this affect the way you experienced the story? Does meeting Sam at two different ages make you feel like you understand him better? 8. Sam says, “I think middle school is the time in life when you first start to develop the grown-up habit of pretending everything’s fine when it really is not.” Do you agree with Sam? Why do you think he feels this way? He then says, “I began to feel as though I’d been transported to a strange planet where nothing was right.” Have you ever felt this way? What, if anything, would you change about this “strange planet”? Do you have any advice to offer Sam? Is there anyone in your life you feel comfortable asking for advice about navigating middle school? Explain your answer. 9. Sam’s parents thought they knew what was best for him with “their obsession about making sure I’d never have the freedom to fall into unseen holes in my future.” Because of their efforts, Sam feels that “Nobody knew what would have been Sam, if choices had been left up to me.” Do you think many eleven-year-olds feel the same way? Discuss with your peers. Is it difficult to be honest with your parents? Are there ever times you think you should question their judgment? Explain your answers. 10. We learn much about four-year-old Sam’s character from his experiences with Bartleby in the well, such as his strong desire to please and avoid disappointing his parents, his emotional resiliency, and his heightened curiosity and imagination. What else do we learn about Sam while he is in the well? What traits does he continue to demonstrate into eighth grade? How does he express these traits in his adolescent experiences? How do you think his experience in the well shaped his childhood? 11. When Bartleby entered the story, what did you make of him as a character? What is his role in Sam’s story? How does he affect Sam? When Sam disconnected from his present reality for periods of time, did you think he was dreaming? Or was he suffering from hallucinations or delusions? Cite references from the text to support your conclusions. 12. One of the novel’s major themes is feeling trapped. Sam experiences several forms of physical and emotional entrapment, including inside a well, a nightmare, a tunnel, a school, a town, and a family that, although well-intentioned, doesn’t understand who he really is. Have you ever felt trapped? If so, how did you handle it? Explain your answer. In what ways is Sam’s perceived tormentor, James Jenkins, also trapped? What are some of the other themes or main ideas that the author conveys to readers? 13. Bartleby’s scenes are rich in imagery. For example, consider the maze of tunnels, a secret treasure room, talking animals, and Ethan Pixler’s coffin buried fifty-four feet underground. How do these images help you understand Sam’s situation? What other images stand out to you? How do they relate to the rest of the story? 14. Why do you think Sam followed Bartleby through the tunnels instead of waiting for rescue? What would you have done if you were Sam? 15. Which passages or scenes did you find to be the most humorous or intriguing? How about the most insightful, disturbing, or unique? Which did you find most thought-provoking or surprising? 16. While in the well, Sam is often more confused than he is frightened, and he has conflicting ideas of what Bartleby’s all about. For example, Bartleby tells Sam to “‘Quit being a quitter . . . I’ll tell you when we go back. But you have to trust me.’” Bartleby then says, “‘I’m lying again!’” and “‘You really shouldn’t be so trusting of strangers, Sam!’” What is Bartleby teaching Sam about trust? What is the author saying about trust? 17. Beneath the humor, Bartleby teaches Sam some important things about growing up. What are some of the more profound or important messages Bartleby conveys to Sam? Do you think Sam understands some of what Bartleby was trying to convey now that he’s eleven? What are some of the things you didn’t understand at four, but understand now? 18. Sam reflects, “Maybe deep down I still blamed James Jenkins for throwing the ball so high, and for falling into that well when I was four years old.” Sam also holds James responsible for his “extreme claustrophobia and not talking for two years . . . ” How do Sam’s assumptions about James and his feelings of being James’s victim initially play into Sam’s adolescence? How did it affect their relationship throughout elementary school and into middle school? What does Sam eventually understand about James as their friendship deepens? 19. At what point in the story did you begin to form your own opinion of James Jenkins, regardless of what Sam believed to be the truth? Cite specific passages or clues. Why can it be difficult to change your opinion of someone? Why do you think Sam continued to believe this narrative about James for so long? 20. James was described as a boy “who nobody liked and everyone was afraid of.” What do you think motivated him to act the way he did? What more would you like to know about James? What perspective does he bring to the story? 21. Sam’s father insists that Sam experience basic survival skills while camping, but these skills only account for a small part of what Sam needs to survive eighth grade. What other skills does Sam need? Discuss with your peers. Why do you think Sam was unhappy about making the jump from sixth to eighth grade? Think about differences between his mental and emotional intelligence. 22. Describe Sam’s dad and what he values. What does it take for Sam to be able to communicate truthfully with his father about what he really wants? Discuss how their relationship changes throughout the story. 23. What role do adults play in this story? Consider Coach Bovard, the homeroom teacher Mr. Mannweiler, Kenny Jenkins, Mrs. Jenkins, and Mr. and Mrs. Abernathy. Cite at least one passage that defines each of these secondary characters. What influence do they have on Sam and James? Is there evidence that they tried to help either boy and their relationship? Do you think they were aware of any issues between the two boys? 24. What issues, if any, remain unresolved or uncertain at the end of the book? For example, how do you account for the Bartleby Until Midnight radio show captured by the Science Club experiment during Blue Creek Days? Explain your reasoning. 25. Did you find the ending satisfying? Explain your answer. What do you think life will be like for Sam and James after they leave Blue Creek next year? Discuss with your peers. 26. Has anything you’ve read about in this story changed your thoughts or opinions about the world around you? What have you learned about other people? What have you learned about yourself? Do you think you might do things differently in the future as a result of reading this book? Explain your answers. 1. While visiting Ethan Pixler’s underground treasure room, four-year-old Sam mentions, “I knew a few things about bats, living in the region of Texas where Blue Creek was . . .” Bat Conservation International (BCI) protects the largest urban bat colony in North America, found under the famous Congress Avenue “bat” Bridge in downtown Austin, Texas, which it promotes as an ecotourism destination. The Statesman Bat Observation Center next to the bridge provides a viewing area for tourists to witness nightly bat flights. BCI also works globally to protect bats and their habitats. Research BCI’s operation. Examine the unique culture of one of the world’s most endangered animals, the often misrepresented yet sophisticated and gentle animals populating the area in which Andrew Smith has set this story. 2. The experience of trauma affects sensations and perceptions, emotional understandings, and responses. Having lived through a traumatic event, Sam, until his eleventh year, could not recall anything that took place during his time in the well. He was unable to speak for two years after the event, and subsequently adopted imagined perceptions and assumptions of reality. Research the symptoms of post-traumatic stress disorder, citing examples from the text that either support or negate the idea that Sam was suffering from PTSD. Then research the treatments for PTSD, and how people can support friends and family going through it. How might Sam’s family have been able to better support him? 3. Sam suffers from extreme claustrophobia as a result of his trauma, characterized by an irrational fear of being trapped inside small spaces. Research the possible causes, symptoms, and treatment of claustrophobia. What advice would you have for Sam after doing this research? Pretend you are Sam’s friend, and write him a letter of support. 4. Does Sam’s passion for cooking and James’s passion for dance inspire you to follow your own passion? Research your most desired field of interest. What would you have to do to prepare for a future in that field? Where and when would you have to study, train, or practice in order to proceed with your chosen career or interest? What barriers or challenges might you have to overcome? What sacrifices might you have to make? Are you willing to do these things to accomplish your dream? 5. Asking the question “What is truth?” leads to many answers, and possibly even more questions. Many say it’s a question that cannot be answered. In The Size of the Truth, each character has his or her own truth as they know it. But can there be conflicting truths? Andrew Smith asks readers to consider the personal truths or beliefs that his characters initially hold, as well as the eventual truths they come to realize as they ask important questions of themselves and each other. What ideas has Sam held to be true, only to realize his assumptions have distorted his reality? Discuss these ideas and implications with your peers. Then choose one or two other characters, and examine the truths and assumptions they’ve made that have defined their life experiences. How are their experiences similar or different to Sam’s? Then consider your own personal truths. Can you make a list of statements you believe to be true? Are they necessarily the only truths? Might there be other perceptions or opinions that could change those beliefs? Pair up with a few classmates to discuss, and share your findings with the class. 6. 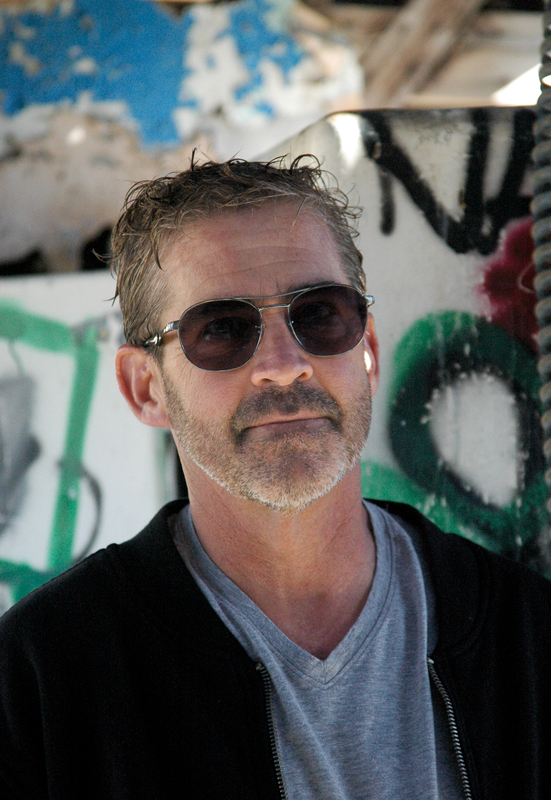 Read two earlier novels by Andrew Smith. In Winger and Stand-Off, readers fell in love with Ryan Dean West, a high school student at the Pine Mountain Academy private boarding school in Oregon. It was there, in Stand-Off, that Smith first introduced us to freshman Sam Abernathy, Ryan Dean’s roommate. You’ll find that life is anything but predictable for Sam once he leaves Blue Creek, Texas. This guide was written in 2018 by Judith Clifton, M.Ed, MS, Educational and Youth Literary Consultant, Chatham, MA.